Is anxiety-free dentistry right for you? 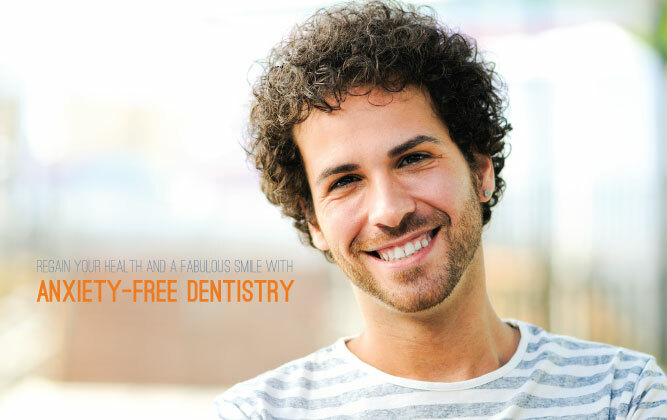 Anxiety-free dentistry is the perfect solution for those avoiding the dentist out of fear. Recovery is quick, and we will work with you to accommodate your budget. You don’t have to be afraid to go to the dentist anymore! By answering the following 4 True/False questions related to your life and attitudes towards the dentist, we can help you determine if you are a good candidate for anxiety-free dentistry. Please note that this assessment tool is not a replacement for a consultation. 1. The idea of multiple visits to the dentist is overwhelming. 2. I am scared, even terrified, to pick up the phone to schedule a dentist appointment. 3. I have trouble with gagging or getting numb at the dentist. 4. Even though I feel pain when I eat, I am delaying dental treatment. If you answered ‘True’ to at least one of the above questions, please call us today at (703)913-1377 so we can schedule an appointment and talk with you about the possibility of anxiety-free dentistry.